Packing healthy lunches for kids that you know they will actually eat can be a challenge. Every parent knows what it means. It means buying the necessary ingredients, waking up early to prepare everything, trying to get the kids to take breakfast, packing the book bag, and finally, packing the school lunch. Although packing healthy foods may seem like a relatively easy task, many parents end up feeling frustrated by trying to come up with healthy food ideas for their kids’ lunch boxes every day. In addition, just because you have packed a healthy meal does not necessarily mean it will be eaten. 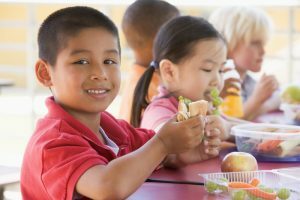 Noisy, loud cafeterias can make it difficult for teachers to supervise kids’ eating habits, and a lunch box swapping system makes it almost impossible to ensure that the food you pack is going to be eaten when your kid/kids are at school. Unfortunately, most parents do not have the time to decorate their children’s foods the way their kids would want, and most care too much about nutrition to pack anything unnatural or processed. Therefore, packing a meal that is both appealing and healthy is easier said than done. However, what your child eats is very important, especially in the middle of the day when proper nourishment is critical to learning. Therefore, it is important to know how to pack a sack or box full of healthy, yet tasty foods. Breakfast is, without a doubt, the most important meal of the day. Thus, you should get your kids off to a good start with a healthy breakfast that will give them the energy they need to thrive on the playground and in the classroom. Studies have shown that kids who eat a healthy breakfast and lunch are often more alert and do better in school. In most school cafeterias, however, there are temptations of vending machines, pizza, and other unhealthy snacks; therefore, you need to try harder to get your kids to actually eat what you have packed. It is also important to let your kids help pack their own lunches. Involving them in this process will give them a sense of responsibility and independence. You may be surprised how much your kids will enjoy choosing healthy and fun food options with you. By letting them help in the process of putting together their meals and snacks for the day, there is a much better chance they will actually eat it. Also, it is important to think outside the box or the lunch box in this case. Kids often complain about boredom with the same snack/lunch every day. Therefore, instead of packing the same old peanut butter and jelly sandwich every day, mix it up with salami and cheese slices with crackers or a whole wheat pita turkey sandwich. A homemade smoothie can also make for a great mid-morning snack. In order for your kids to make smarter diet options on their own, you need to lead by example. You should provide healthy food options for breakfast, lunch, and dinner. In addition, you should work together with your kids to find healthy food items that they actually enjoy. You could also make their school-time meals more fun by cutting fruits in new ways, using a cookie cutter to shape sandwiches, or picking a color theme for each day. Finally, if you find yourself racking your brain every night for inspiration for the next day’s lunch, hang on to several kid-tested-and-passed lunchbox ideas. Include something from different food groups, but be creative.